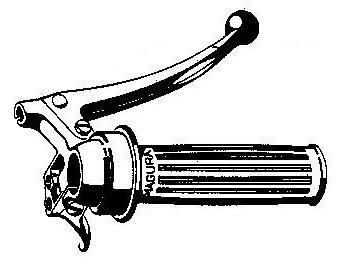 Magura was founded in 1893 by inventor Gustav Magenwirth as a manufacturer of gasoline motors, hydraulic press pumps and water pressure devices. 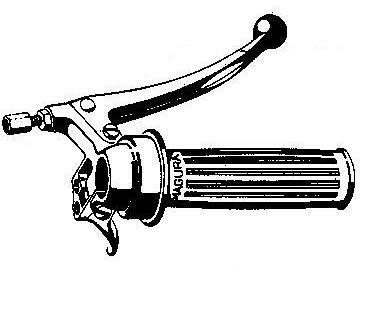 Since 1923 in Bad Urach, Germany, they have produced handlebars and handlebar controls for mopeds and motorcycles. 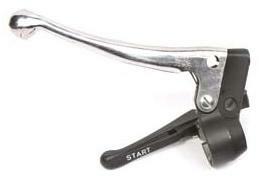 They are an industry leader, and still produce handlebar controls for all major makes. Since the 1970s, the company has also made many products for the bicycle industry. The name Magura is from Magenwirth and Urach. The logo is from a rotary rack developed in 1930. 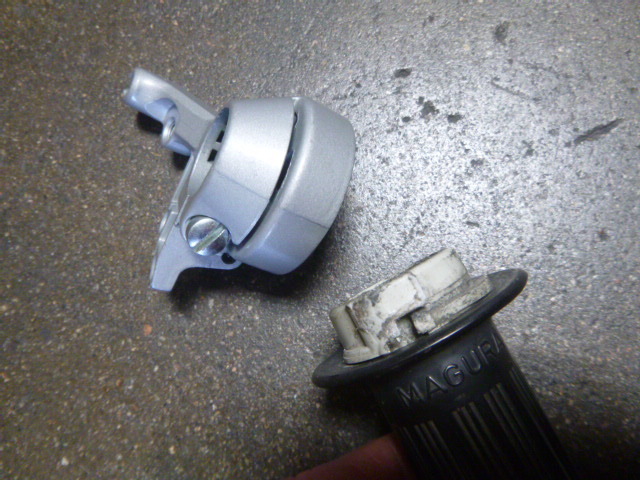 Magura is the most common brand of moped controls. There are two main types, the Magura “Wrap Around”, where the throttle cable wire wraps around and attaches to the twist tube, and the Magura “Sliding Block”, where the throttle cable attaches to a block that slides in a spiral slot in the twist tube. 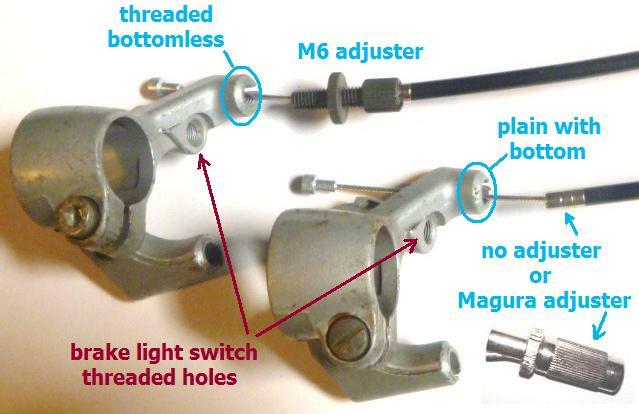 Magura “Open Wrap Around” silver controls are used on 1950’s and 1960’s Puch, Tomos, Sears Allstate, and many others. Some are cast aluminum levers, and some are folded sheet aluminum. Most of these did not have threaded holes for brake light switches. 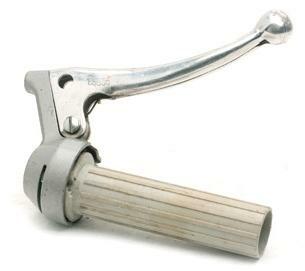 Ball-end levers began in the 1970’s, for safety. 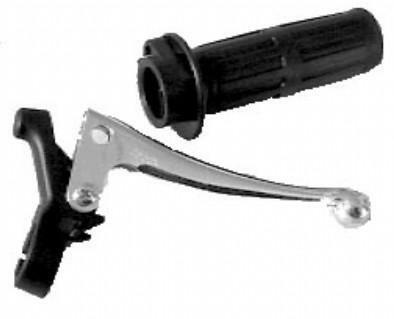 Magura “Open Wrap Around” black controls were on 1980’s Euro models, but not on US models. 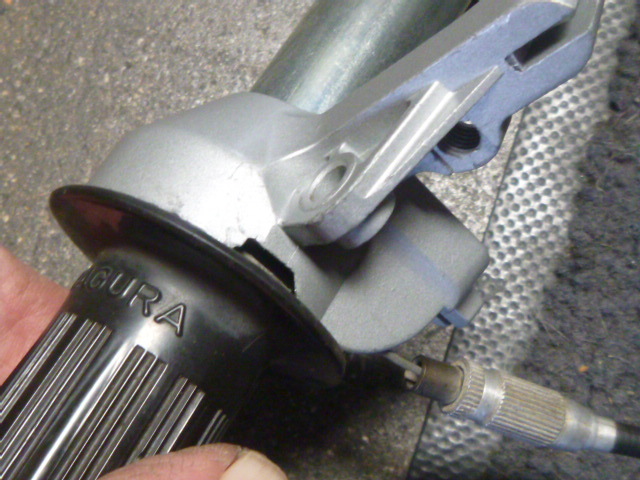 Like the other Magura wrap around throttle controls, the twist tube has a groove that locks onto a tab in the housing. The two are locked together first, then slid onto the handlebar. 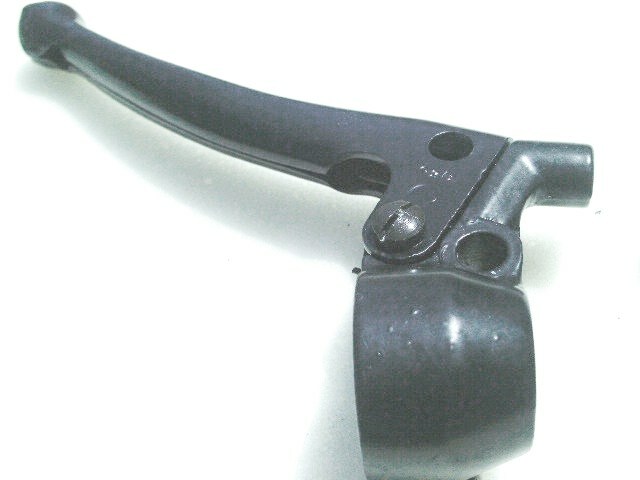 Once on the handlebar they cannot become separated. These have a plain hole with bottom, for the brake cable. Most do not have a hole for the a brake light switch. 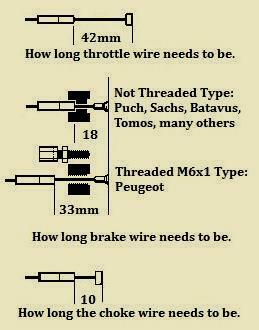 Peugeot or Not Peugeot: There are two ways to stop the brake cables. 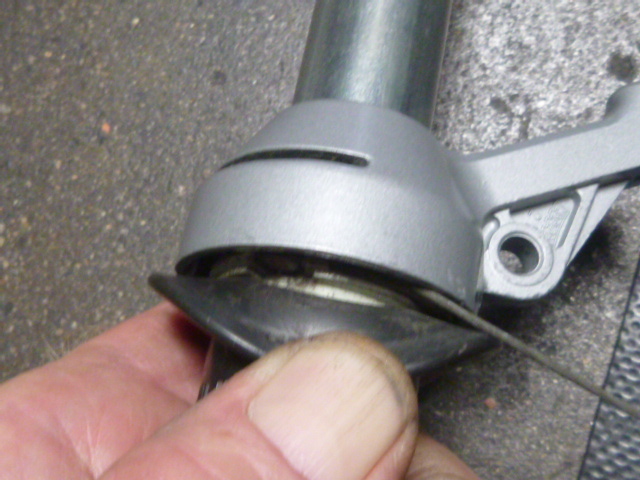 The Peugeot way is to have 6mm threaded bottomless holes in the housings with 6mm adjusters stopping the cables. 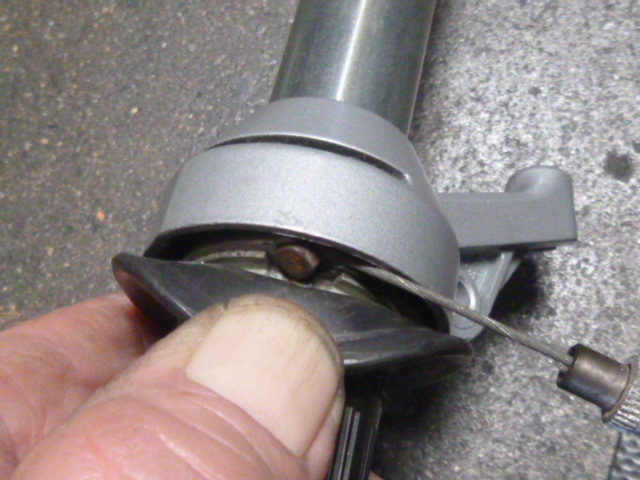 The non-Peugeot way is to have the housings stop the cables (or the inline Magura-type adjuster) with a slotted recess (hole with a bottom) instead of threads. 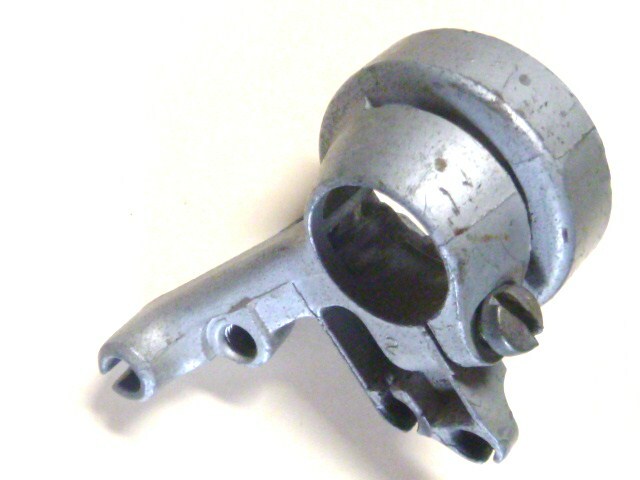 You can convert to Peugeot style by drilling and tapping to M6-1.0 thread. But there is almost no adjustment range (because most of the hole is already too big, 7mm). Magura “Wrap Around” silver controls are used on 1970’s Batavus, Colombia, Flandria, Foxi, Flying Dutchman, Hercules, JC Penney, Kreidler, KTM, Kynast, Murray, Odyssey, Puch, Sachs, Sears, Sparta, 74-85 Tomos, and others. These US models all had threaded holes for brake light switches. Most Euro and Canada models did not have brake light switch holes. 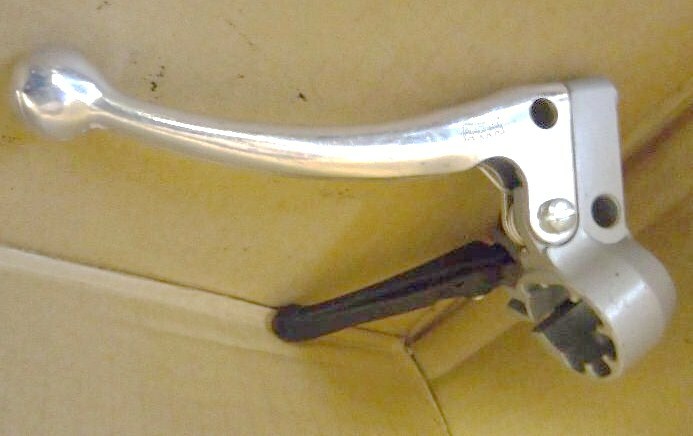 The brake cable holes on both sides have two versions, M6 threaded bottomless (Peugeot style), or 7mm plain hole with bottom (non-Peugeot style). These controls on US models all had ball-end levers except for Sears Free Spirit. 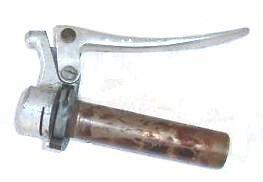 Magura-clone “Wrap Around” black controls are used on 1979-85 Tomos Silver Bullet. 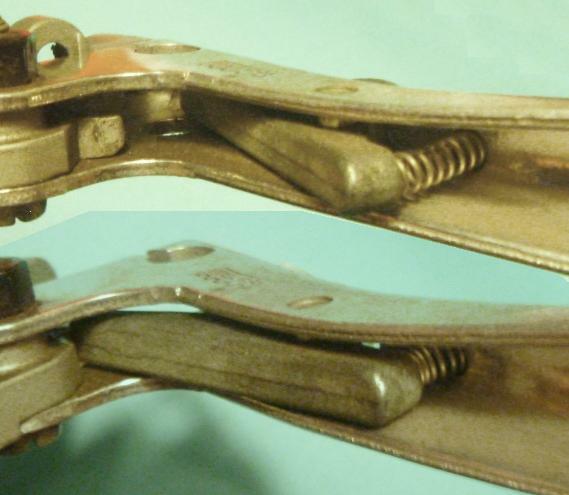 They are made in Yugoslavia to be Magura-compatible. The brake cable holes are 7mm plain with bottoms. Magura “Late Wrap Around” silver controls are used on 1980’s Colombia, Hercules, Murray, Puch, Sachs, 79-83 Trac, and others. 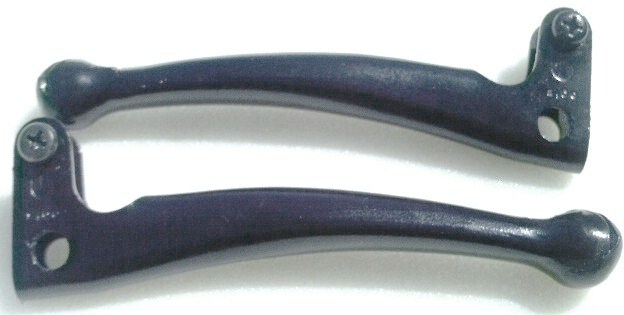 The housings are thicker and less rounded. The left has a mirror hole. 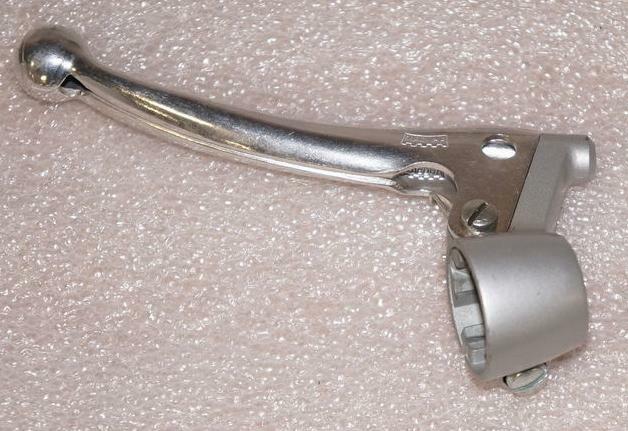 US models had threaded holes for brake light switches. But most Euro and Canada models did not have brake light switch holes. In these photos you cannot tell if there are brake switch holes or not. 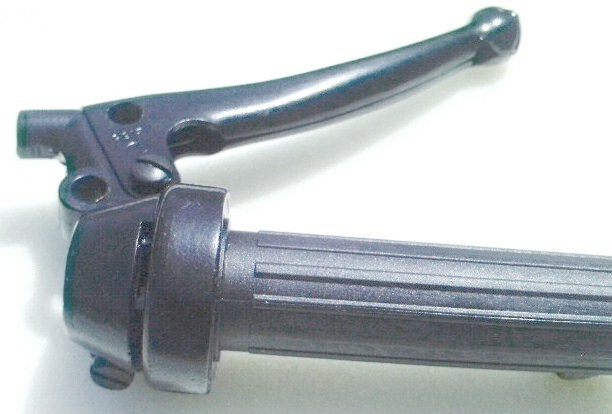 Magura “Late Wrap Around” black controls are used on 80-83 Puch Maxi, 80-85 Sachs (Hercules) and others. 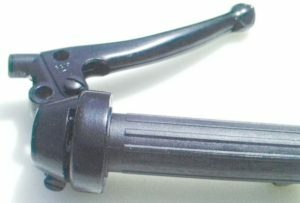 Puch-Magura “Sliding Block” black, used on 78-86 Puch deluxe models. Most of these are the early, common kind with a screw on the slider holding holding the cable wire. The cable wire itself has no upper end piece. 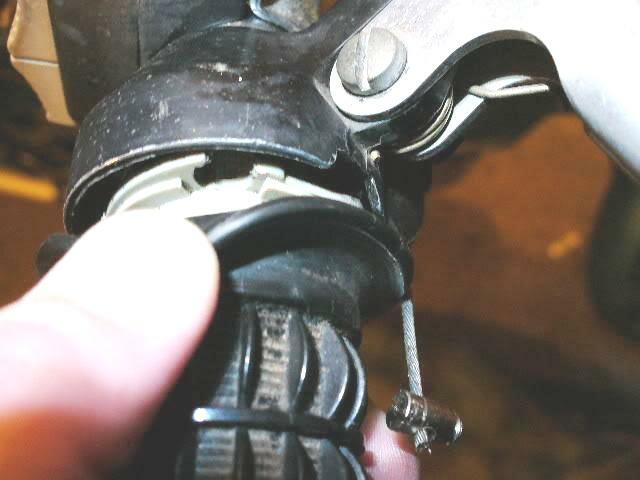 It takes a “universal” or “single ended” throttle cable. Some of these are the late, uncommon kind with no screw on the slider. Instead the cable wire has an upper end piece 3mm “inline barrel” soldered onto it. The cable is specific to that set-up, and is “double ended”. all models. Housing has a slot for cable. It is a subtle difference, but side by side you can see there are two different folded aluminum original Magura levers. 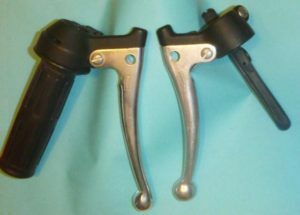 The 1980’s “late” right lever, on the left, is longer and straighter than the 1970’s “early” left lever, on the right. When they are not side by side, it is really hard to notice. 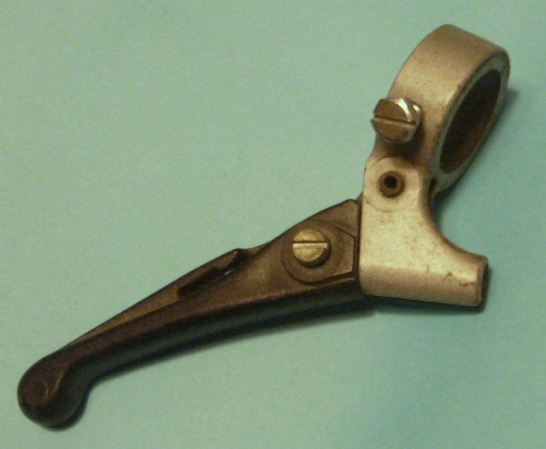 At some time around 1980, the folded aluminum levers changed from “early” to “late”. At around that same time, the grip style changed and the housing color changed from silver to black. When the 1970’s parts ran out, moped dealers replacement parts were replenished with the 1980’s versions. So even back in 1984, sometimes customers had to settle for a black housing instead of silver, or a longer lever instead of a short one. As mentioned above, the pieces snap together, but only when removed from the handlebar. 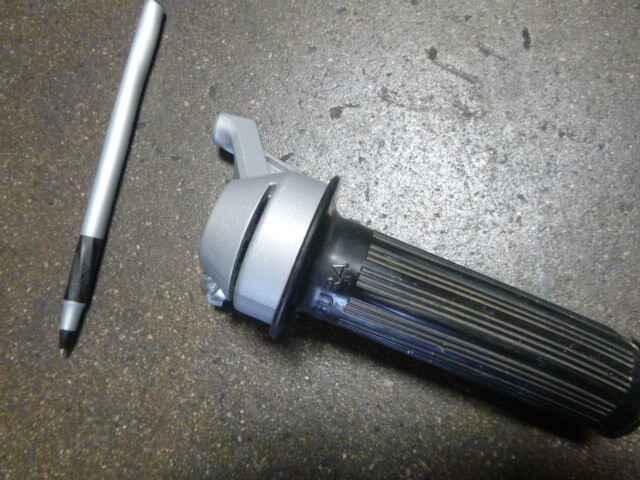 Twist tube: The throttle housing has a tongue that goes into a groove in the twist tube. The two pieces are first locked together while off the handlebar, and then slid on as a unit. Then the twist tube is kept from moving sideways. Thumb trigger: Not all mopeds have this, but all the wrap-around housings have a provision for it. 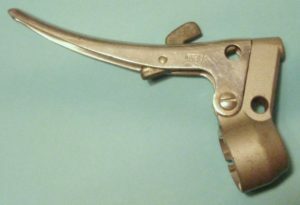 This is also called a choke lever or a decomp lever. 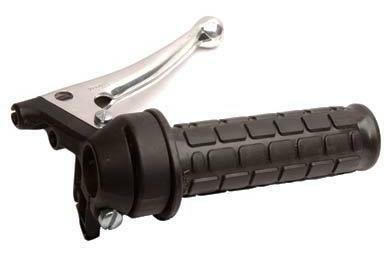 The trigger has half-circle-shaped posts that slide into slots in the throttle housing, but only when off the handlebar, and in the “squeezed past max” position. Once on, the handlebar prevents it from detaching. 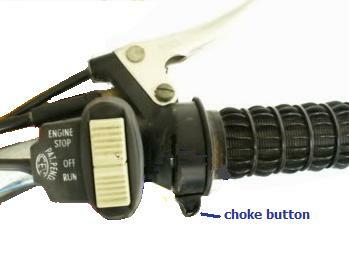 Tomos A3 auto choke thumb button: This button, when pushed in, lets the throttle cable go all the way slack for cold starting. When it is not pushed in, it allows the cable to stay a little taut for normal idling. Idle speed is adjusted by the tightness of the throttle cable, at the handlebar by the Magura type cable adjuster. 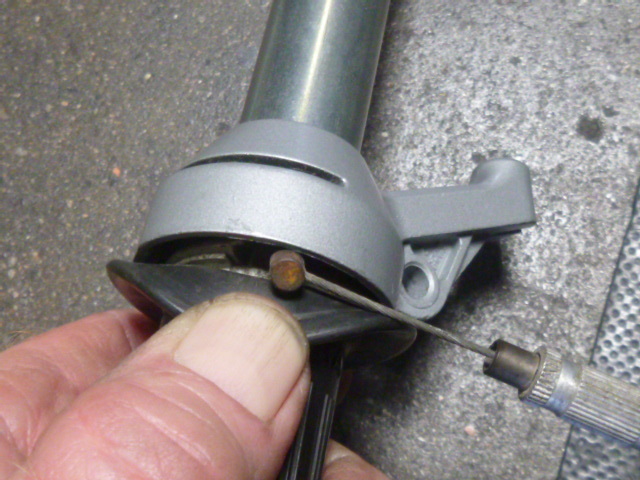 Installing a throttle cable: With an original Magura twist tube, the cable installs from the outer side, just behind the grip. Turn the grip forward to the closed position. Locate where the cable end is. Peel the flange of the grip there back with your thumb, and hold it there. 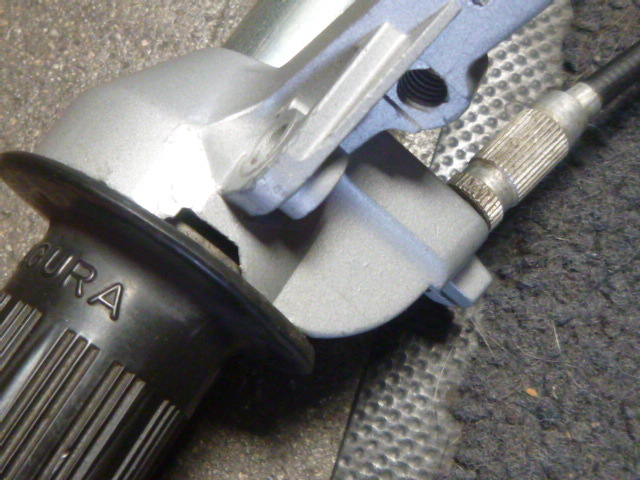 With the other hand, place the sideways barrel end of the throttle cable into the cavity. Lay the wire over the ridge, and wrap it around the curved guide. When pulled taut it should fall into it’s groove. The throttle should pull the wire and move free. With a Magura-clone twist tube, the cable installs from the inner side. So the twist tube has to be removed. That means the whole throttle has to be removed from the handlebar. But the cable is more protected. 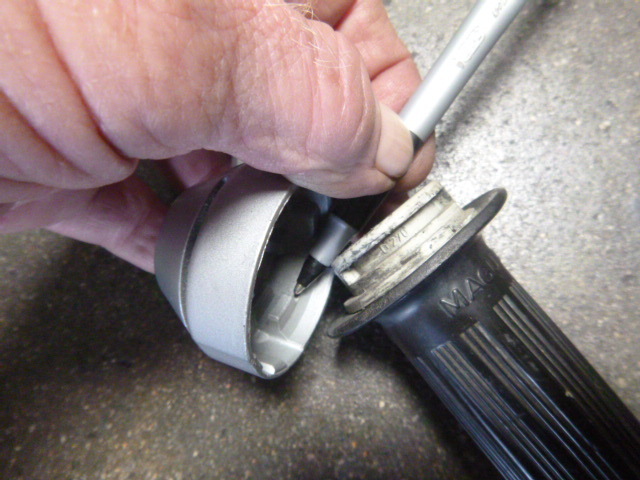 Restoring a damaged groove: The curved cable guide groove can become worn in the middle. It can be so bad that the throttle feels like a hack saw, the way it makes a ripping sound, has a rough feel, and sticks sometimes. It cuts through cables. 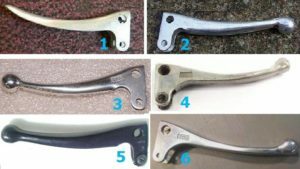 The cause of the worn groove is lack of lubrication. Moped cables and controls need oil occasionally. 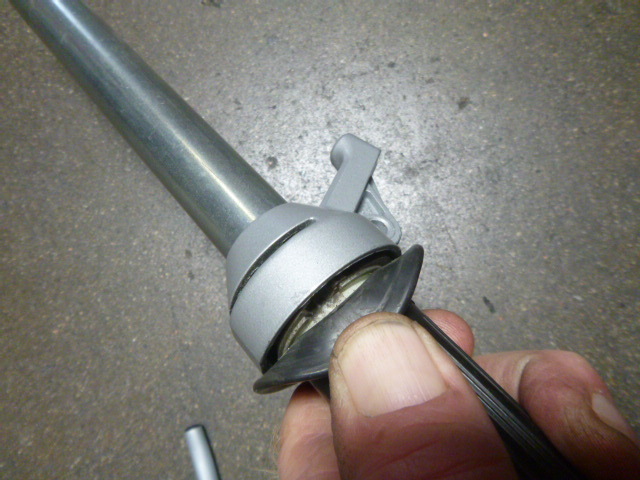 The remedy is to re-cut the bottom of the curved guide. The best tool is a masonry hack saw blade. It has the exact width and round shape. 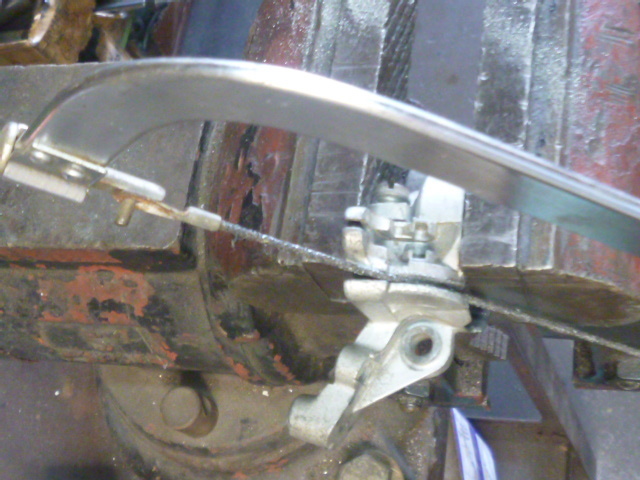 The linear saw is moved in a curved motion. The bottom of the channel is visually checked every few strokes, to see what areas need more cutting. Lubrication: Lube the cables and controls with a drip oil, like 3-in-1 or Tri Flow or any high tech lubricant. 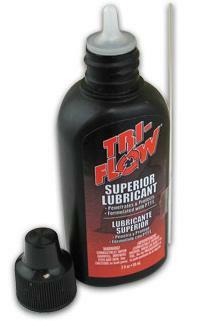 Tri Flow is thin so it penetrates in and clings to metal, like WD40. But after awhile when most of the liquid drys up, it leaves behind microscopic Teflon particles embedded in the metal surface. Making custom cables: Here are the distances of the exposed cable wires, for Magura wrap-around type moped controls. You are currently browsing the archives for the Magura category.